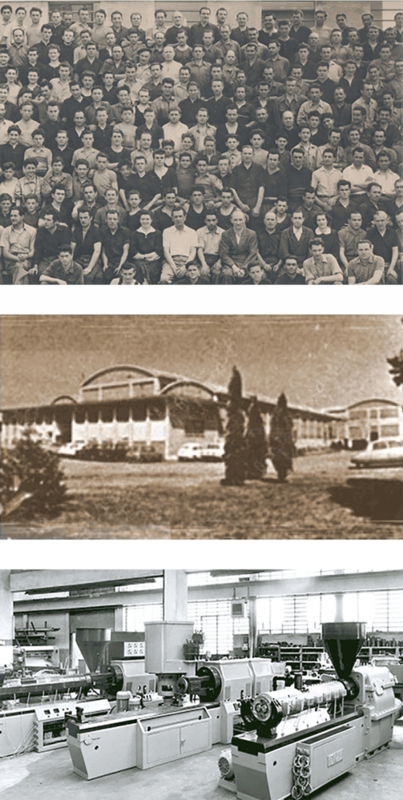 The entrepreneurial Colombo family starts a foundry specializing in casting iron and special alloys (Fonderia Getti Speciali). ICMA SAN GIORGIO® established to support the foundry, initially manufacturing machines for wood processing, and later specializing in high-precision machine tools. ICMA® focuses on the emerging plastics industry designing its first patented twin-screw extruders, creating the foundation for the company’s core business. It important to highlight that Italy is a pioneer in plastic technologies and that twin screw corotating extruders were invented in Italy in 1938 by an innovative Italian engineer, Roberto Colombo., founder of LMP. ICMA develops a revolutionary technology to produce a composite sheet made of polypropylene and wood flour. Marketed under the trade name, Wood-Stock™, the technology was adopted worldwide by automakers including Fiat, General Motors, Ford, Nissan and others for moulding interior components. ICMA builds on its prowess with twin-screw co-rotating extruders designed for technical compounds, thermoplastic rubber, masterbatch, etc., and quickly becomes a world leader in compounding technology. ICMA introduces a patented system for the Extrusion/Compounding of a multi-layer sheet (using a polymer with natural fillers called Naturecore™). This application was developed for the agro industrial sector for producing disposable crates, fully recyclable. ICMA develops an advanced mathematical model to simulate the extrusion process of co-rotating extruders. ICMA's accumulated experience is successfully employed in developing new advanced compounding technologies in fields such as reactive compounding, bio compounds, recycling, PET, WPC and composite applications. The company today is managed by a very professional and dynamic team which has given a strong industrial and market development through the expansion of production facilities, market reach and significant investment in terms of both human resources and manufacturing capabilities.